Now that former UFC light heavyweight champs Quinton “Rampage” Jackson and Rashad Evans have both confirmed their wildly-hyped UFC 114 showdown, Octagon fans can rest easy knowing they’ll finally be treated to the fight they’ve been asking for. Unfortunately for Jackson, it’s a scrap that wasn’t supposed to go down. Apparently, UFC president Dana White’s pants are on fire because Rampage claims that his on-again-off-again homie lied to him about getting the next shot at Lyoto Machida’s title after he did White and Co. a favor by co-starring opposite Evans in “The Ultimate Fighter: Heavyweights” reality show last season. “Honestly, Dana lied to me. He said I didn’t have to fight Rashad. I could fight Machida after the show,” Rampage told FightersOnly. “After [TUF 10] he told me I’m going to have to fight Rashad, so all the fans were saying ‘oh he’s ducking Machida’ – and I didn’t say anything, because I was doing [the UFC] a favor! Rampage was thrown in the UFC doghouse after he “retired” from MMA to play B.A. Baracus in the movie remake of “The A-Team” last September. Not only was the role the opportunity of a lifetime, but the popular 1980’s show helped forge a bond between Rampage and his father during his adolescent years, one of the few times he recalls his entire family being happy and together. As touching as that was, from the UFC’s standpoint, they had promoted the hell out of his impending scrap with Evans throughout their tenure on TUF, which just happened to be the most watched season since it’s inaugural year. In addition, their shootout was specifically set to take place in Memphis, Tennessee – not only the organization’s debut in M-Town, but Rampage’s hometown as well. Although the UFC willingly took Rampage back after filming wrapped on “The A-Team” and have since assigned him his next payday, the controversial slugger has had enough and wants out … ASAP! In December 2006, Zuffa, LLC, the parent company of the WEC and UFC, acquired Rampage’s multi-fight contract when they bought-out select assets from the World Fighting Alliance, Jackson’s previous employer. Since that time, no official information has been released regarding his UFC deal, including how many fights are remaining. 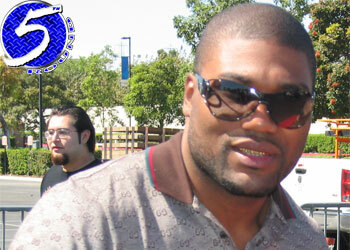 Rampage and Evans are set to headline UFC 114 on May 29th at the MGM Grand Garden Arena in Las Vegas, Nevada.